Hello, there. Remember me? Probably not. I haven’t seen you for 3 months some time now. (Time? What is time, really?) And for that, I apologize. It has been impeccably poor timing in terms of being a missing person, since I’ve done more musical things in the past 3 months than I had in the year leading up to my absence. So maybe that’s it. Maybe I’ve been off being oh-so-musically current that I simply had zero time to give attention to something that I used to pay attention to most: HauteThought. You’re right, that’s not it. And if that was true, it’s a pretty sorry excuse if you ask me. The truth? Work picked up and the last thing I wanted to do when I got home was sit in front of a screen again. Lame reason, I know, but it’s a true one nonetheless. I really, truly have been doing music related things as the time passed. I was able to see Kenny Chesney and Tim McGraw at the Brothers of the Sun tour, go to Lollapalooza for the 2nd year, visit Nashville (Music City) with my family (a place I’ve wanted to live since 6th grade) and this past Friday, I saw Gotye in concert. See? I haven’t been a musical shut in. I’m taking my most recent musical getaway to jump back into the blogosphere. Thank you, Gotye. I have to be honest with you. Up until I featured Gotye’s “I Feel Better” as song of the day, I only knew “Somebody That I Used to Know.” Basically, I was like everyone else. The day I stumbled across “I Feel Better,” I dug a little deeper into Gotye’s Making Mirrors album and I’m so thankful I did. What I found was an eclectic mix of sounds and styles, all under one album title. That said, when I discovered he was coming to Chicago, the question ‘should I go?’ never crossed my mind. ‘What should I wear,’ however, did. Gotye played Chicago’s Charter One Pavilion on Friday night and showed Chicago a thing or two about what he can do as a musician. Sure, I knew he had a different and slightly addicting voice (and also sounds eerily similar to Sting and Phil Collins at times). Yes, I knew he was from Australia. Yes, I was aware that everyone with a set of working ear canals knew the song “Somebody That I Used to Know.” What I didn’t know impressed me more. I didn’t know how extremely involved Gotye would be with his performance. Half of my photos from the night show Gotye as a blurred figure because he ran from percussion set to a synthesizer back to a different percussion set throughout the entire performance. So the guy doesn’t simply have a good voice. He’s also a percussionist. Color me impressed. Standout songs are easy for me to pinpoint. Naturally, “Somebody That I Used to Know” was performed very well. There was a bit of a surprise here, though. I assumed his opener, Missy Higgins, would sing her way through Kimbra’s portion of the song. Instead, Gotye had the audience sing this portion while he tinkered away on one of the many instruments he’s mastered. “State of the Art” also proved to be a standout on Friday. The matching animation behind depicted a family who purchased a state of the art music machine. It has the ability to recreate sounds normally produced by standard musical instruments, much like a computer. Gotye sings through a distorted mic, “Now for an arm and a leg, We get three half-dozen beats to choose from. So now we can pretend that there’s an orchestra in the loungeroom.” Being the EDM/all things techo-hater that I am, I couldn’t help but smile as I saw the animated family become horrified by the musical machine they purchased. Gotye’s top song was not the single, nor was it the song I purchased a ticket to hear (as it turns out, he didn’t get a chance to play it). 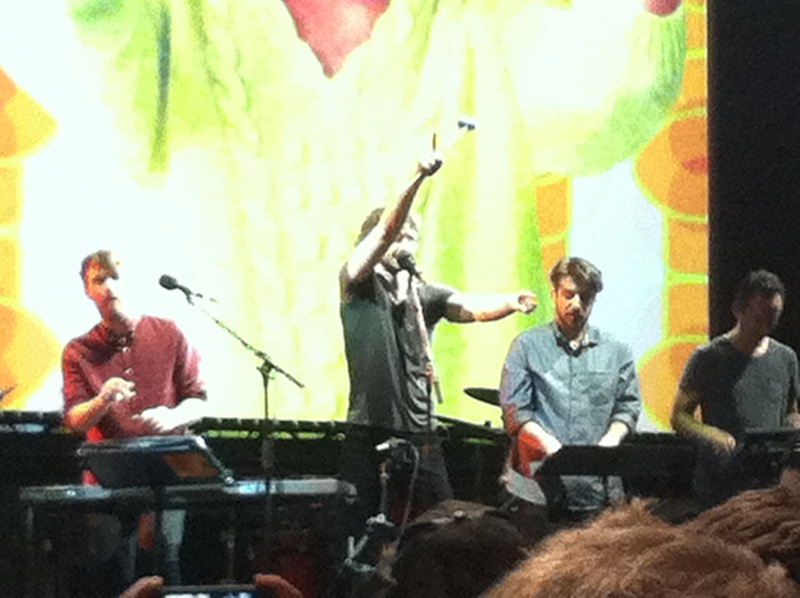 “Eyes Wide Open” proved to be Gotye’s strongest performance of the evening. This is a song that not only delivers musically and lyrically, but gives a strong message, as well. While I usually pay attention to lyrics, I didn’t truly hear them until the live performance. The song talks about walking the plank with our eyes wide open. This push against ignorance and choosing not to stand up for things caught my attention immediately. (I’ve since done a bit of Googling and found the song may be about global warming.) Thank you, Gotye, for using your talent to send a message. Tags: Charter One Pavilion, Eyes Wide Open, Gotye, HauteThought, Music, Review, Somebody That I Used to Know, State of the Art. Bookmark the permalink.